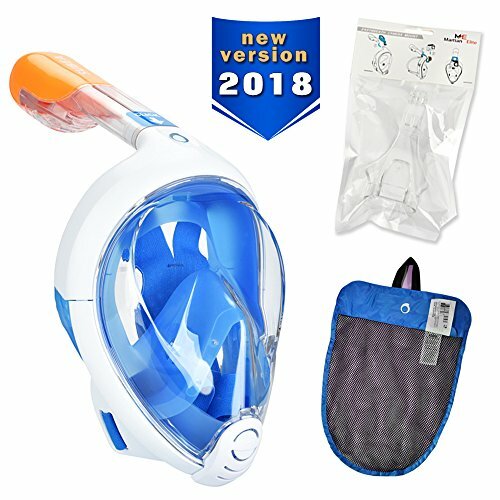 Full-face snorkel masks seem to be all the rage in 2018. It’s understandable really, as they make it incredibly easy for even first-time snorkelers to dive right in and have an enjoyable experience. They’re great for offering a fantastic field of vision and keeping saltwater out of your mask. However, there are a lot of snorkel masks available to consumers these days, and some of them can be hit or miss when it comes to quality. In order to help you separate the good from the bad, we’ve gone ahead and compared dozens of masks in order to figure out which is the best full-face snorkel mask of 2018. Listed below are our top five picks – read on to find out which of them will ultimately take the crown as the best mask of 2018! 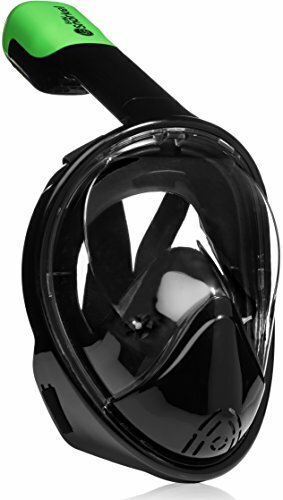 Kicking off our list is a terrific snorkel mask that comes in a variety of options and price ranges. The Ocean Reef Aria mask comes in models available for less than $20 all the way on up to higher end $200 models. The Aria boasts the largest field of vision out of any snorkel mask out there, and as far as we could tell, that statement is pretty accurate. We tested out the most basic Aria model and came away thoroughly impressed. The internal face mask partition allows fresh air venting which helps to prevent the mask from fogging up, ensuring that you can take full advantage of the impressive field of vision available. Meanwhile, the exceptional dry top system works great for keeping water out of the snorkel, and there’s a self-purging valve located at the bottom of the mask for purging any water that does manage to seep in. The best thing about the Aria mask is that it comes in a wide range of options to suit your specific needs. If you’re a novice snorkeler looking for your first mask, the basic model is more than enough to get you started. Likewise, if you’re an experienced snorkeler, you’ll find a lot to like about their higher-end models as well. Next up, we have an excellent snorkel mask that’s been designed by the inventor of the Easybreath Full-Face Snorkel Mask, Decathlon. This product has recently been updated to a modern 2018 version, with an updated brand change from Tribord to Subea (SUBaquatic Experiences are Amazing) to go along with it as well. Decathlon have continued to build upon their innovative ‘Easybreath’ design with this mask. It’s been upgraded from their traditional snorkel masks to provide a larger panoramic viewing area with a 180° effect. A double air-flow system that is identical to the one used in domestic extraction fans works to help keep the mask from fogging up. When you’re submerged underwater, a waterproof design with a dry mechanism plugs the top of the snorkel in order to keep air in and salt water out. You’ll be able to breathe comfortably underwater, making snorkeling an incredibly rewarding experience even for first timers who might be a little bit nervous. The Subea Easybreath Snorkel Mask is also available in two different sizes with a high-quality silicone skirt that provides maximum comfort and a watertight seal. The functional but rather basic GoPro attachment mount is just the icing on the cake with this stellar offering by Decathlon. Moving on, we come to a mid-range offering by the Easy Snorkel company. This full-face snorkel mask is a perfect choice for both beginners and expert snorkelers who are seeking out a high quality full-face mask at an affordable price. The first thing you’ll notice when wearing this snorkel mask is just how incredibly comfortable it is. 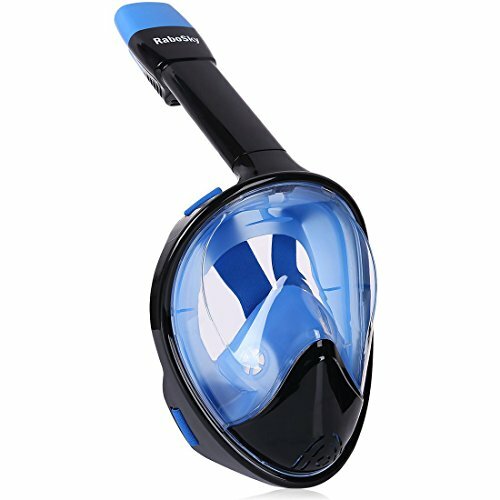 Easy Snorkel has designed it with ergonomics in mind, which has resulted in what is easily one of the most comfortable snorkel masks we’ve ever tried. Going along with the cozy fit are easy-to-adjust soft fabric straps that make it a breeze to put the mask on and take it off. The 180° panoramic view will let you fully immerse yourself in all of the beautiful marine views that are awaiting you. You’ll be able to enjoy those underwater views to the fullest as well thanks to the impressive ‘Float-Tech’ anti-leak dry snorkel technology and anti-fog design. 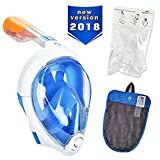 All in all, this is an incredibly attractive option when it comes to full-face snorkel masks, especially for first-time buyers. The fourth entry on our list is the RaboSky full-face snorkel mask. As with the other masks we’ve covered thus far, this full-face mask is perfect for would-be snorkeling enthusiasts who have been turned off before by traditional snorkeling masks that can easily fog up and are constantly getting saltwater in the tube. You’ll find everything that you’d be looking for in a high quality full-face snorkel mask with this one. Offering an impressive 180° panoramic view and a removable GoPro camera mount, you’ll be able to permanently capture each and every breathtaking view that you come across under the waves. In order to make sure that you can fully appreciate those views, RaboSky have also included a separate breathing chamber that creates an airflow away from the viewing visor, helping to keep your mask from getting fogged up. And in order to eliminate any saltwater making its way in, a top dry drop system and anti-allergic silicone skirt work in tandem to create a comfortable seal when you put the mask on. And speaking of comfort, you’ll definitely be feeling comfortable when wearing this mask thanks to the soft adjustable fabric straps – it’s easy to put on and take off, meaning you’ll be able to breathe naturally underwater in no time at all! Last but not least, we come to the Kirecoo full-face snorkel mask. This mask is an incredibly affordable entry-level option. In spite of the fact it’s a budget-friendly mask, Kirecoo have built a surprisingly high-quality full-face mask that will delight snorkelers of all skill levels. As with the other snorkel masks we’ve covered in this article, this mask offers a full 180° panoramic view and a removable GoPro camera mount. Not only will you be able to fully immerse yourself in all of the wonderous views waiting for you underwater, but you’ll also be able to capture them permanently to share with your family and friends. The mask is also rather user-friendly, with easy-to-use elastic straps that make putting it on and taking it off a breeze. Once you’re actually in the water, it’s nearly effortless to breathe naturally through your mouth or nose. An anti-fog and anti-leak design is also in place to help make sure you have a clear and comfortable snorkeling experience every time you’re out in the water. To top it all off, Kirecoo also offer a full 100% refund within 30 days if you’re not satisfied with your purchase for any reason, as well as a guaranteed 1-year replacement option. Although we were big fans of all five of the above full-face snorkel masks, in the end there was only one of them that we could strongly recommend over the others. The Decathlon Subea Easybreath Full-face snorkel mask is simply too good. While it’s certainly pricier than most of our other recommendations, you’re definitely getting what you pay for with this mask – a high-quality design that flat out does the job properly. 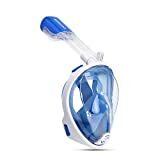 The double air-flow system works great for preventing the mask from fogging up, while the ‘Easybreath’ design is outstanding for making sure you can comfortably breathe even when submerged. Add an extremely comfortable design into the mix and you end up with one winning full-face snorkel mask. The only flaw we could find with the mask was that the GoPro mount was a little bit cheap compared to the high quality found throughout the rest of the mask – but even still, that’s not nearly enough to be a deal-breaker. When it comes to bang for your buck, you simply can’t go wrong with the Subea Easybreath.